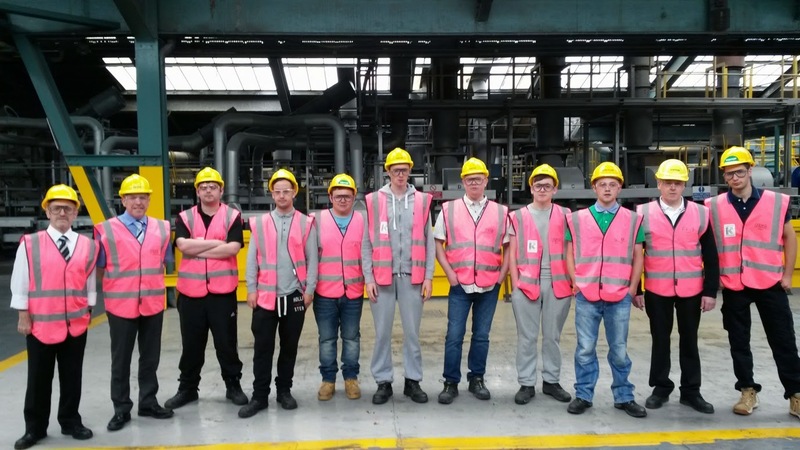 1st and 2nd year Apprentice Glazing students from South Lanarkshire College in East Kilbride, along with 4 members of staff, had a very interesting site visit in support of their technical knowledge to show them the processes involved in the production / manufacture of glass. They were given a detailed tour of the Pilkington Watson Street facility in St Helens, which was historically the first location of the Pilkington glass production. Pilkington staff hosted the tour, giving the group an insight into the rolled glass process, from raw materials to storage. The apprentices were very keen, asked a lot of questions of the very friendly and very knowledgeable Pilkington staff and were a credit to themselves and the College. Phil Douglas, the GQA EQA for South Lanarkshire College, said “Sadly, I couldn’t attend the visit this time but it is a credit to George and all the staff at the College who gave up their own time to travel from Scotland to visit the Pilkington factory at St Helens with the apprentices. I am really pleased the apprentices and the staff got a great understanding and fascinating insight into the glass manufacturing process at such a historic location. It is fantastic that the College and Pilkington Glass, both GQA Approved Centres, have this relationship, and I’d like to thank Pilkington’s, especially Helen and Diane, for facilitating the visit and their continuing support of the apprentices. It is a great opportunity for apprentices to see first-hand how the material they use and see every day is manufactured”.